Guelph experimenters WHOOP-Szo polished off their album Niizhwaaswo while running a screen-printing program for Inuit youth in Arctic Canada, and now they've released a video for the collection's title track. "Niizhwaaswo" uses familiar instrumentation, with the arrangement centred around vocals, drums and guitar. This isn't your average rock song, however: the angular guitars are often run through buzz-bomb effects, while the drums are jazzy and mixed low, and the vocals are abstract and distant. 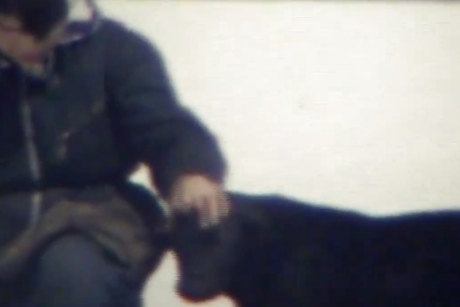 The video is similarly inventive, since it pieces together 8mm footage that a friend's grandparents made in northern Ontario. We see hunting expeditions, a mix of snow and summer, and lots of scratchy visual noise. Scroll past WHOOP-Szo's tour schedule to check it out. Nearly all of the dates are with WTCHS, and the bands will be releasing a tour-only split cassette.